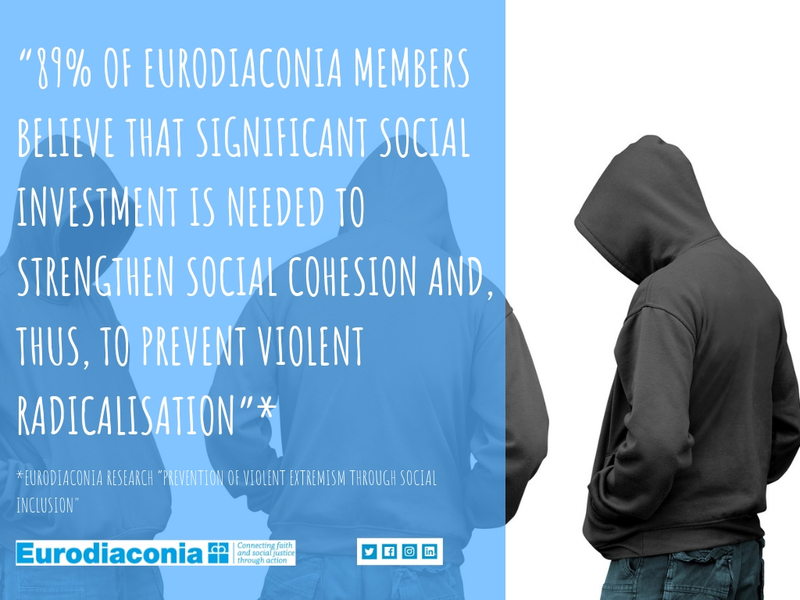 Early today, Eurodiaconia released a study of its members’ work on the “Prevention of Violent Extremism through Social Inclusion”. The study is divided into four parts. The first part aims to give a brief insight into the current theoretical background of radicalisation prevention work. The second part focuses on survey results of PVE from a social inclusion perspective and how that approach can be strengthened. Third, the status quo of radicalisation prevention work being performed by selected Eurodiaconia member organisations is described and its social impact analysed. Finally, suggestions for further improvement of preventive radicalisation efforts in the form of policy recommendations are formulated. The study was conducted between October and December 2018. By answering an online survey and taking part in (telephone) interviews, 8 Eurodiaconia member organisations from 6 European countries participated. A total of 9 projects are presented. The issue of violent extremism is high up on the European political agenda. Eurodiaconia has observed that the focus of many initiatives lies on religious radicalisation and that political radicalisation seems less prominent and therefore shifts public debate. Contributing to the discussion and highlighting this research gap, Eurodiaconia is tackling the Prevention of Violent Extremism (PVE) from a social inclusion angle and what role diaconal initiatives can play in the process. Thereby, focusing on the question of how (political) radicalisation that leads to violence of young people can be prevented in the EU. The paper builds on the findings of Eurodiaconia’s Urban Partnership Seminar (2018), the Mapping of Eurodiaconia members’ work in urban areas (2018), and an event in the European Parliament on The Role of Social Inclusion in Preventing Radicalisation (2017). Eurodiaconia will continue its work in the area of preventing political radicalisation through social inclusion at European level together with its members and partner organisations. The Church City Mission Oslo will host Eurodiaconia’s first Urban Areas Network Meeting from 9-10 October 2019 in Oslo (Norway). Furthermore, the network will continuously exchange and promote its good practices and discuss issues such as the importance of prison counsellors and their role in preventing radicalisation offering narratives of hope and through their link between prisons and communities. To know more about our members’ experience on the prevention of violent extremism, read our latest research paper.